Beverley Owen (née Ogg; May 13, 1937 – February 21, 2019) was an American television actress, best known for having played the original role of Marilyn Munster on the sitcom The Munsters, before the role was taken over by Pat Priest. In 1956, Owen appeared in her first TV role in As the World Turns. Owen appeared on the shows The Doctors, Kraft Mystery Theatre, The Virginian, Wagon Train, and Another World, and in the feature film Bullet for a Badman, starring Audie Murphy, after which she got the role of Marilyn Munster on The Munsters. In 1972, she played Dr. Paula McCrea for nine months in the soap opera Another World. Owen left The Munsters after 13 episodes and returned to New York, where she married Sesame Street writer and producer Jon Stone in 1966. They were married for eight years until 1974. She had two daughters, Polly and Kate. After her divorce in 1974 she continued to pursue her studies in early American history and earned a master's degree in 1989. ^ a b c d e f Nolasco, Stephanie (February 25, 2019). "Beverley Owen, the original Marilyn in 'The Munsters,' dead at 81". Fox News. 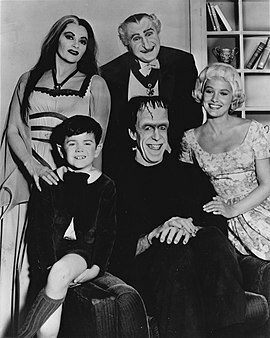 ^ a b c "Beverley Owen, the original Marilyn on 'The Munsters,' has died at age 81". USA TODAY. February 25, 2019. Retrieved February 26, 2019. ^ Evans, Greg (February 25, 2019). "Beverley Owen Dies: 'The Munsters' Original Marilyn Was 81". Deadline. Retrieved February 26, 2019. ^ "Beverley Owen, Original Marilyn from 'The Munsters,' Dead at 81". TMZ. ^ "1st Marilyn of TV's 'The Munsters,' Beverley Owen, Dies". Best Classic Bands. February 21, 2019. Retrieved February 24, 2019. ^ Needham, Lucy (February 25, 2019). "The Munsters actress Beverley Owen dies after battle with ovarian cancer". mirror.co.uk. Retrieved February 26, 2019.